And you thought you needed an Asterisk® PBX for your users to enjoy FREE text-to-speech applications such as current News Headlines and Weather reports from the convenience of their telephone. Well, move over Asterisk. FusionPBX™ for FreeSWITCH™ now offers virtually identical functionality with all of the terrific advantages that FusionPBX provides: reliability, updates, performance, security and an unmatched UC platform with no rivals. To get started, make sure you have completed the steps in our FusionPBX introductory tutorial. Intuitive support in FusionPBX for interactive TTS or STT applications is not (yet) available. So we’re doing the next best thing. Once or more a day, we will use cron jobs to retrieve the latest News Headlines and Weather reports for your local area. 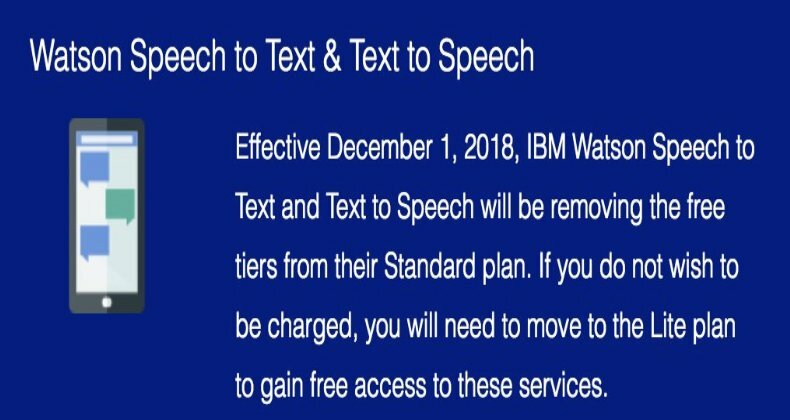 Then anyone using your PBX can pick up a phone and listen to the News Headlines by dialing 951 or U.S. weather forecasts by dialing 947, or worldwide weather forecasts from ApiXU by dialing 949.1 We’ll be using IBM’s awesome TTS engine to handle the text-to-speech chores. We think you will agree that IBM’s offering is the best in the business. And you can’t beat the price. 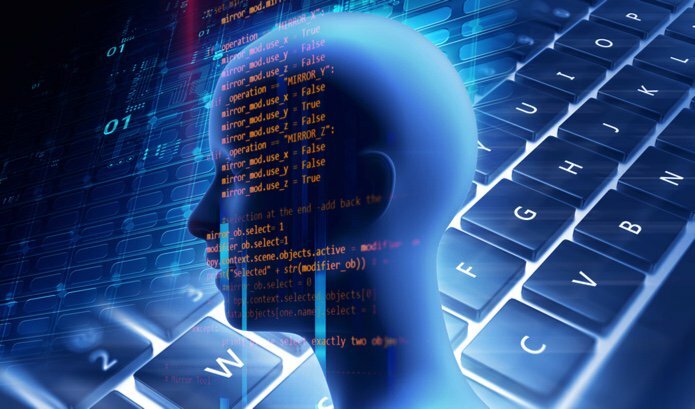 After your first free month, you get a million characters of FREE text-to-speech synthesis every month forever! For ApiXU worldwide weather data, your first 2,500 queries are also FREE every month. You can start your free, 30-day trial of IBM Bluemix services without providing a credit card. Just sign up here. Once your account is activated, here’s how to obtain credentials for the TTS service to use with FusionPBX. Start by logging in to your IBM Bluemix account. Once you’re logged in, click on your account name (1) in the upper right corner of your web page to reveal the pull-down to select your Region, Organization, and Space. 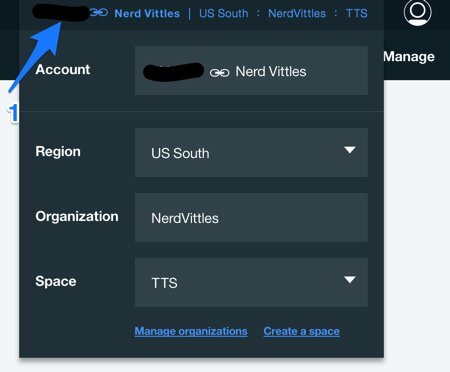 Follow the blue links at the bottom of the pull-down menu to create an Organization and Space for your TTS service. When your Text to Speech application displays, click Service Credentials and then click New Credential (+). When the Add New Credential dialog appears, leave the default settings as they are and click Add. Your Credentials Listing then will appear. Click View Credentials beside the new entry you just created. Write down your URL, username, and password. You’ll need these in Step #4 below to configure the IBM Bluemix TTS service. Logout of the IBM Cloud by clicking on the little face in the upper right corner of your browser window and choose Log Out. Confirm that you do, indeed, wish to log out. Before you can obtain worldwide weather reports, you’ll need to sign up for an account at ApiXU.com. Once you’re registered, log into your account and copy down your API Key. You’ll need it in a minute. Once you have your IBM TTS credentials in hand, there are only five simple steps to get everything set up for TTS application support on FusionPBX. When we’re finished, anyone on your PBX can pick up a phone and listen to the News Headlines by dialing 951, a U.S. Weather Forecast by dialing 947, or Worldwide Weather for most international cities by dialing 949. IMPORTANT: Once you’ve copied the placeholders into position, use a browser to open the FusionPBX Dashboard for each of your domains. Navigate to Apps then Recordings and play each of the three placeholder files that were uploaded: News-update, Weather-forecast, and Weather-zip. Otherwise, they won’t be available for use in the next step of the setup. Before you can implement the Nerd Vittles TTS Apps for News Headlines, Weather by ZIP Code, and Worldwide Weather, we first need to create the proper environment on the FusionPBX side to support the new applications. We’ll be using the FusionPBX Dialplan Manager for this purpose. We need to set up three extensions to handle the calls: one for the News Headlines and one for each of the Weather applications. Login to your FusionPBX Dashboard with a browser. News Headlines: From the FusionPBX Dashboard, navigate to DialPlan, then Dialplan Manager, and click the Add (+) icon. 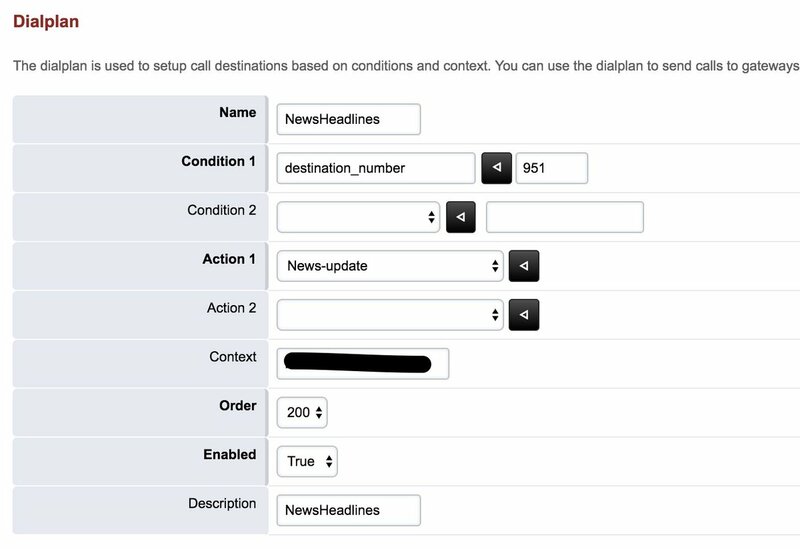 Using your default Context, insert the following new entry into the Dialplan for News Headlines (951) by filling in the Name, Condition1, Action1, and Description fields as shown below. Leave the other defaults. Then click SAVE. When the Dialplan listing reappears, find the NewsHeadlines entry in the list and click the pencil icon to Edit the entry. Add 951 in the Number field as shown below. Then click SAVE and BACK. Now let’s add the Dialplan entries to support the two Weather applications. Weather by ZIP Code: From the FusionPBX Dashboard, navigate to DialPlan, then Dialplan Manager, and click the Add (+) icon. 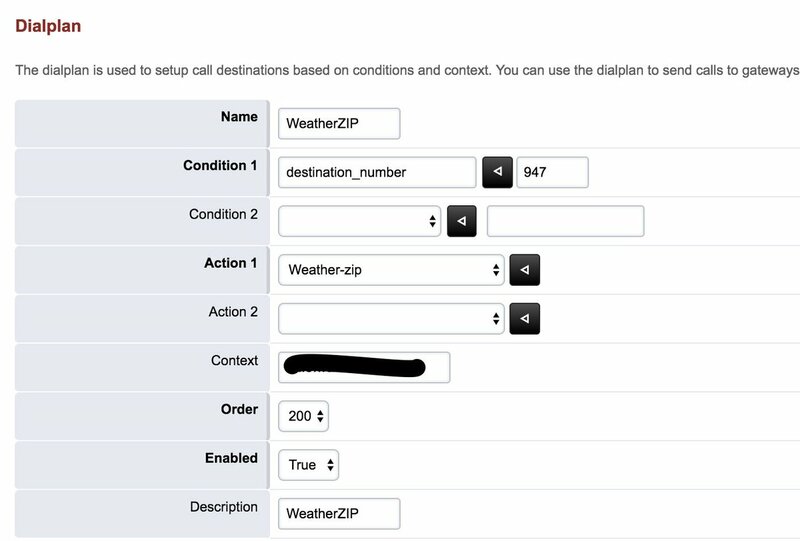 Using your default Context, insert the following new entry into the Dialplan for Weather by ZIP Code (947) by filling in the Name, Condition1, Action1, and Description fields as shown below. Leave the other defaults. Then click SAVE. When the Dialplan listing reappears, find the WeatherZIP entry in the list and click the pencil icon to Edit the entry. Add 947 in the Number field as shown below. Then click SAVE and BACK. Worldwide Weather: From the FusionPBX Dashboard, navigate to DialPlan, then Dialplan Manager, and click the Add (+) icon. Using your default Context, insert the following new entry into the Dialplan for Worldwide Weather (949) by filling in the Name, Condition1, Action1, and Description fields as shown below. Leave the other defaults. Then click SAVE. When the Dialplan listing reappears, find the WorldwideWeather entry in the list and click the pencil icon to Edit the entry. Add 949 in the Number field as shown below. Then click SAVE and BACK. Try things out by dialing 947, 949, and 951 from any FusionPBX extension. Be sure these work before proceeding! Finally, we need to add cron jobs to run the three update scripts at least once a day. You can run them more often depending upon your needs. We have these configured to run at 6:15 am and 6:20 am every day. Adjust to meet your own requirements. On a busy PBX, you probably don’t want to run them during the workday. Finally, we need to run the News Headlines and two Weather update scripts once to put current data in place for FusionPBX callers. After the initial setup, the cron jobs will update the News Headlines and Weather reports every day moving forward. Press ENTER as each of the scripts finishes to get back to a command prompt. Now you’re ready to try things out. From any phone connected to your PBX, dial 951 for current News Headlines. Then dial 947 for a local Weather Report matching your zip code. Finally, dial 949 to retrieve a worldwide weather forecast for most international cities. If you don’t yet have a FusionPBX server set up but would like to sample the voice quality of the TTS applications running on our FusionPBX server in New York, here are several ways to try them out using an IVR we set up using an IBM voice prompt from last week’s tutorial. Airport codes reflect (PROVIDER LOCATION-SERVER LOCATION-DID LOCATION). Support Issues. With any application as sophisticated as this one, you’re bound to have questions. Blog comments are a terrible place to handle support issues although we welcome general comments about our articles and software. If you have particular support issues, we encourage you to get actively involved in the PBX in a Flash Forums. It’s the best Asterisk tech support site in the business, and it’s all free! Please have a look and post your support questions there. Unlike some forums, ours is extremely friendly and is supported by literally hundreds of gurus and thousands of users just like you. You won’t have to wait long for an answer to your question.